Public Ad Campaign: Keep It Going Ads Parodied? Keep It Going Ads Parodied? It's wonderful to see people conscious enough of their public space that they take the time to alter it. If anyone knows the person responsible for this I would love to be put in touch with them. I have a project coming up and I think they might be interested in participating. 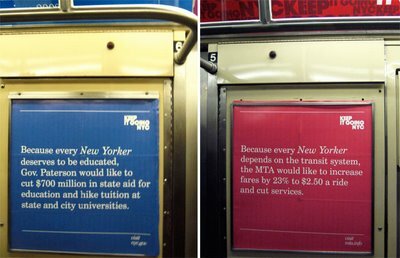 A reader sent along these photos from the E train, saying, "I am sure that they are fakes and that they are making fun of the current Keep it Going NYC campaign." We asked an NYC Transit spokesman if they were fakes, to which he replied, "I have no idea." Smells like a renegade campaign to us! 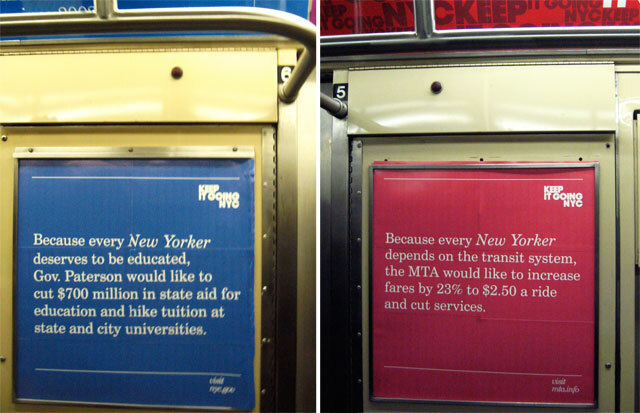 And unlike the KeepNewYorkMoving ad campaign, it's not asking Albany for funding, but criticizing both Governor Paterson for his budget cuts and the MTA for its proposed fare hikes and service cuts.